This web-based teaching resource illustrates the effects of variable retention harvesting on soil microbial biodiversity and healthy functioning of soils in forest ecosystems. Video footage and soil data were obtained in the Silviculture Treatments for Ecosystems Management (STEMS) long-term experiment located in the Sayward Forest west of Campbell River, British Columbia. This multimedia teaching resource has been developed to enhance material covered in the APBI 402 / SOIL 502 – Sustainable Soil Management course , offered at the University of British Columbia, Vancouver. The learning objectives of the teaching resource are to allow students to (1) identify major soil microbial groups, (2) describe key functional roles of soil microbes, and (3) determine if green tree retention on harvested sites leads to healthy soils through the maintenance of soil organisms and their functions. 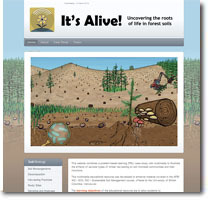 Click here to visit the Soil Biodiversity website.